Our executive director Randy tossed out a dozen paperback copies of Left of Bang. He said, as if no one could possibly question his suggestion, "We are bringing in Patrick to speak at the conference." I picked up the copy that landed in front of me at the long table, filled with board members from the police association of which I was a director. Obviously Randy was impressed with not only the book, but one of the co-authors, Patrick Van Horne. And when I read the book and met Patrick in person (for the first time), I found out why. While the book is based off the US Marine Corps' "Combat Hunter Program," the authors broadened the application of its concepts to a wider audience and environment. Left of Bang immediately went on to my must-read list for not only police officers, but anyone serious about personal safety and readiness. One of the highlights of the book is the unique behavior clusters, where people's observable behavior is categorized into one of four mutually exclusive categories: dominant, submissive, comfortable, and uncomfortable. 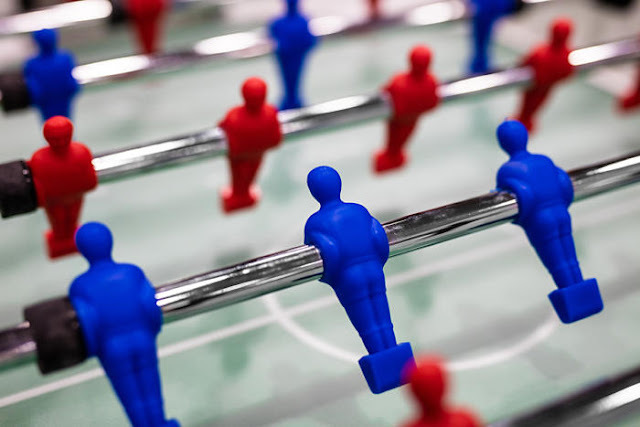 A person's "cluster" is then compared to others' in his/her surrounding environment. For example, a coffee shop in the morning rush might be packed with regular customers, all who are comfortable in the setting. A first-time customer might be readily identifiable by displaying signs of discomfort - by scanning the room for the place to order, or analyzing the menu overhead. In this scenario, the new mildly uncomfortable customer is an anomaly to the baseline. These behavior clusters are used by the military, law enforcement, and security industry for early warning signs. Recognizing potential attackers allows the observer to stay "left of bang" - or to the left of a bad incident when plotted on a timeline running left to right. A person who is "right" of bang would be reacting or responding to the bad incident, instead of avoiding or preventing. The same anomalies can be observed with isolated individuals, when the compared to the observer's experiences with people in similar circumstances. For example, a police officer has certain expectations of a motorist during a traffic stop. 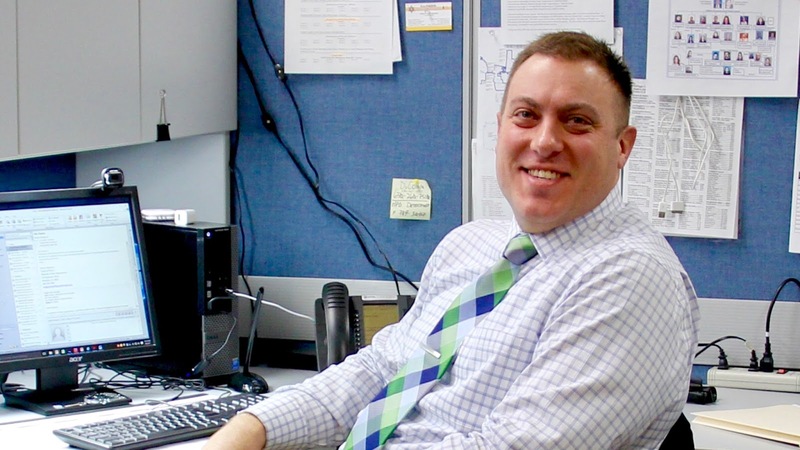 A veteran cop subconsciously compares the motorist's behavior to a tall stack of traffic stop experiences - and should intuitively know when something is wrong. 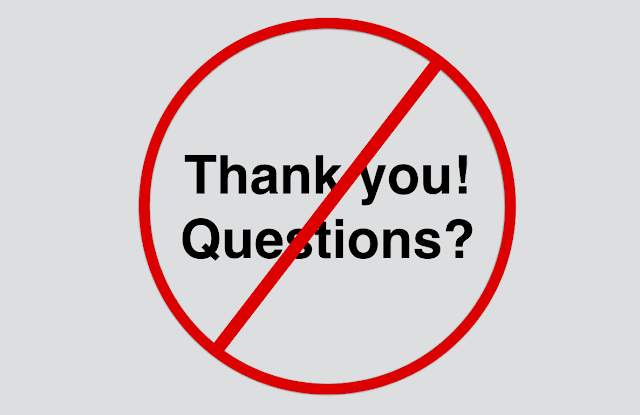 Savvy cops will act on that suspicion - whether asking probing questions, requesting backup, or changing his/her demeanor. 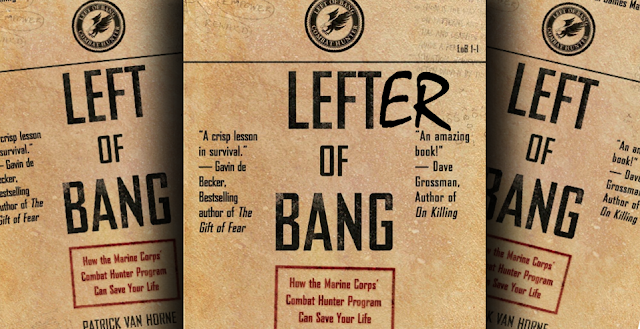 Left of Bang gave me a new vocabulary to communicate and compartmentalize aspects of human behavior and conflict that I had learned informally as a longtime police officer, SWAT operator, crisis interventionist, and detective. But I also knew that the four behavior clusters could be applied more generally than simply with threat recognition and finding criminals in crowds. As a police officer and detective, I use the four behavior categories for handling emotional crises, calming upset citizens, persuading compliance, encouraging cooperation, soliciting information, interviewing witnesses or victims, and interrogating suspects. The clusters could be used for engaging in all sorts of interpersonal contact and conflict. And how do I use the clusters? I, myself, exhibit behaviors that fall into specific clusters - to shift a person from one undesirable cluster into a desirable one. For example, an upset man who aggressively postures is in an undesirable state. A police officer needs to respond creatively to transform the threatening man into a calmer state of comfort or submission. I intentionally demonstrate a variety of dominance, submission, comfort, and discomfort at the appropriate times. Wait! Did I say that I become submissive as a cop?!? Absolutely! Well...not become submissive....but rather display submissive behavior. In the right context, with the right people, for the right reasons. Showing vulnerability (whether physically or emotionally) surely has its risks; it also has garnered great results through demonstrating trust and relinquishing the power of decision-making to others. 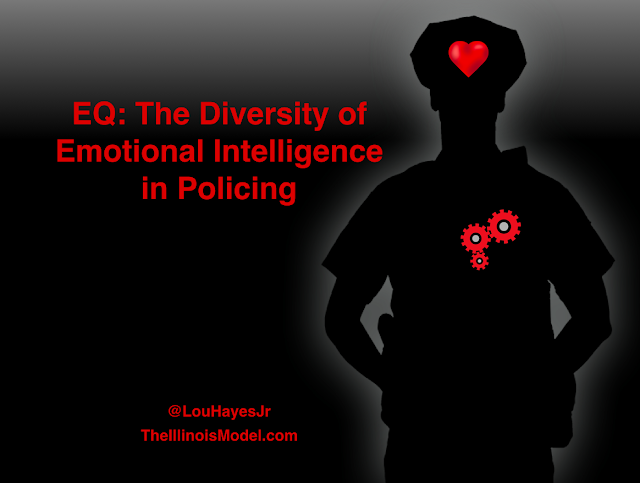 If police officers are going to be truly effective at engagement, conflict, or persuasion, it's necessary to be emotionally intelligent. They must be able to navigate all four clusters, switching back and forth as a situation adapts. We used to call this: people skills! Cops who default to one demeanor over another (in law enforcement, it tends to be the dominant cluster) are working with a limited toolbox. I nickname these narrow-skilled folks "one trick ponies." Intimidation and threat surely holds its place in police officer's toolkit; I'll argue much less than I used to believe as a young, aggressive patrolman. Many of those who recommend Left of Bang or The CP Journal relate their usefulness to human threat recognition, self-defense, and personal safety. While their application is strong here, the concepts have bigger and broader usefulness. I suggest looking at how else you can exploit the lessons of human interaction. I began sharing these experiences as a police trainer with my learners. 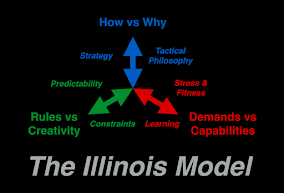 Expanding the behavior clusters into all aspects of conflict has proven itself to me and my teams. Can you imagine having a consistent language for things like hostage negotiation, use of force for non-compliant subjects, criminal interrogation, collecting witness statements, and calming people in crisis? An identical method to describe not only subject demeanor, but officer behavior? A way to articulate behavior in police reports and court testimony? When we splice these theories into all human interactions, we can get even lefter of bang. And that's a good place to be. 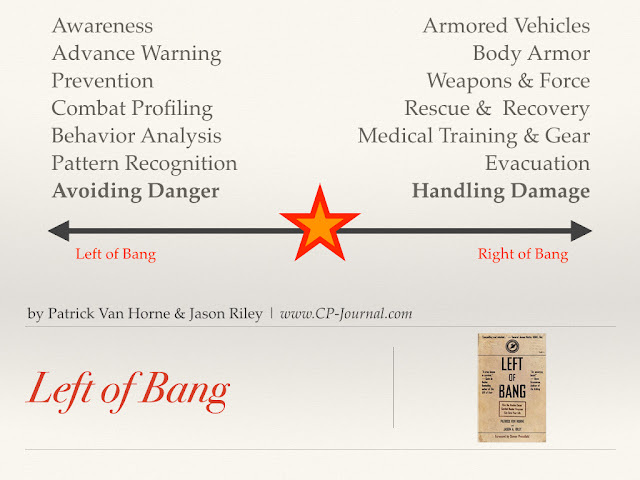 as always, you make me think of another way to look at something, I always applied the lessons from "Left of Bang" in a more literal sense for threat awareness through personal safety. But you are right, there is so much more to this idea. I do think too many try to stay "Left of Bang" but when the time comes to go "Right of Bang," they are either way too eager to abandon the Left and go to the Right or way too reserved to go Right even when it's necessary. Maintaining clear lines & even a hyperbolic flowchart ahead of time can solve some of these problems imho. Strategy first, then tactics. Priorities do not excuse us from neglecting the things that are farther down the list of importance.